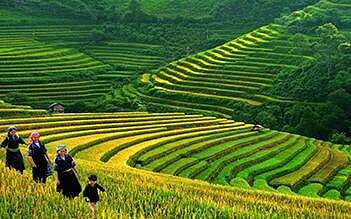 This is one of the most popular trips we offered including visiting various villages in Sapa. 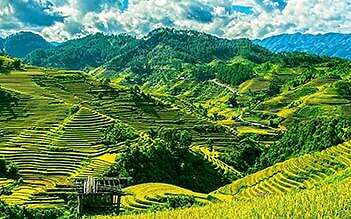 In this tour, you have chance to see interesting places, ethnic minorities villages of H’Mong, Tay, Dzao, Dzay and Xa Pho minorities and mountainous regions of Sapa, near the Chinese border. Known for intricate embroidery, traditional crafts and silver jewelry, this will provide an opportunity to make fantastic memory. "Accommodation - oneId: #4", "Accommodation - oneId: #1"
More than 45 days prior to trip departure: No charge (Full refund will be made but transaction fee will be paid by you). 30-45 days before arrival: 10% of total tour price. 15-29 days before arrival: 50% of total tour price. 7-14 days before arrival: 75% of total tour price. Within 7 days before arrival: 100% tour price. The above fees are subject to an added bank transaction fee. 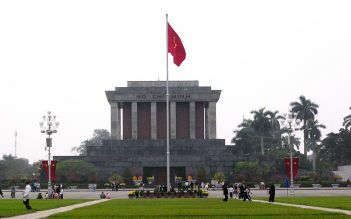 20.30 Pickup at your hotel and transfer to Hanoi Railway Station for the night train to Lao Cai Station. Sleep on the train. 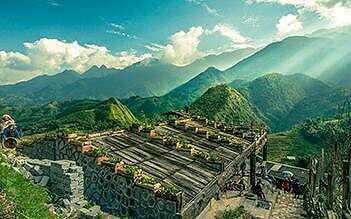 Arrive in Lao Cai and transfer to Sapa. After breakfast, explore around Sapa. Start trekking after lunch. 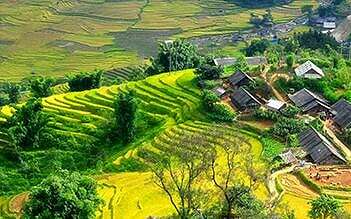 Visit Lao Chai Village and then walking through hillsides and along Muong Hoa River, visit Ta Van village. Explore the daily life of Dzay minority and spend a night at a Dzao family. After breakfast, get to a village located at the foot of Hoang Lien Son range via bamboo forests. Visit a waterfall and a rattan bridge. Then get down to the river, cross it and keep going to Supan village for 2 minorities – The H’Mong and the Red Dzao. Get off the road to go down hill to BanHo village. O/N at Ban Ho village with a Tay family. Get up early in the morning for fresh air and peaceful daily life of the people. After breakfast, walk uphill to a smallest and almost untouched village of the Red Dzao (Namtoong). Go further to another village on the other side of the mountain range to see the XaPho ethnic group in MiSon village. Have dinner and O/N at a Tay family in Thanh Phu village. After breakfast, walk back to Supan village where take a jeep back to Sapa. On the way back, visit the ancient stone circle (stones decorated with ancient carvings which are said to have described to the life of the people lost in the mists of prehistory). After breakfast, free time to visit Sapa town and market. Have lunch. At 15:30, get on bus to Lao Cai railway station. Have dinner in Lao Cai. 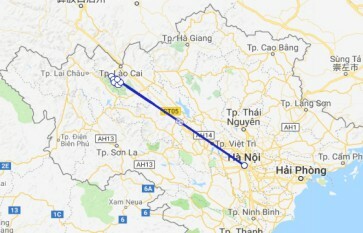 Then take the night train back to Hanoi. End of tour. Passengers are advised to leave big luggage at hotel for convenience. You should expect a morning thick fog if you plan to do this trek during the winter season. The ladies were friendly to help during the trekking and have a conversation with you. Exchange stories if you'd like to. Prepare an extra pair of good shoes, yours will probably be covered with thick mud. The village was lovely. I believe it's even more beautiful during other seasons. Prepare to be approached by the locals there selling their wonderful handcrafted items. The trip was really enjoyable and we got loads of great photos. The views were amazing and the women were really helpful. We saw the local culture as well as lots of rice paddies. The trek was harder than we thought and could be explained a bit better. You need to be reasonable fit and they are right in recommending trekking boots. The guides do try to sell you stuff but only at the end and it was all nice handmade items anyway so we didn’t mind. Plus they deserved it for the help they gave us on the trek. The food was nice too and plenty, there were locals trying to sell stuff there which wasn’t ideal but we got over it. Would definitely recommend. Great day spent walking among the local villages. Our guide was super friendly and accommodating. Good trip, great local lunch, couldn’t fault the day! Upon return a representative from the tour met us to check everything had been positive. We felt very looked after!